Il 2015 inaugura per i Magma un nuovo periodo di celebrazioni, produzioni, concerti ('Le Tour sans fin') e iniziative varie per festeggiare quarantacinque anni di attività. 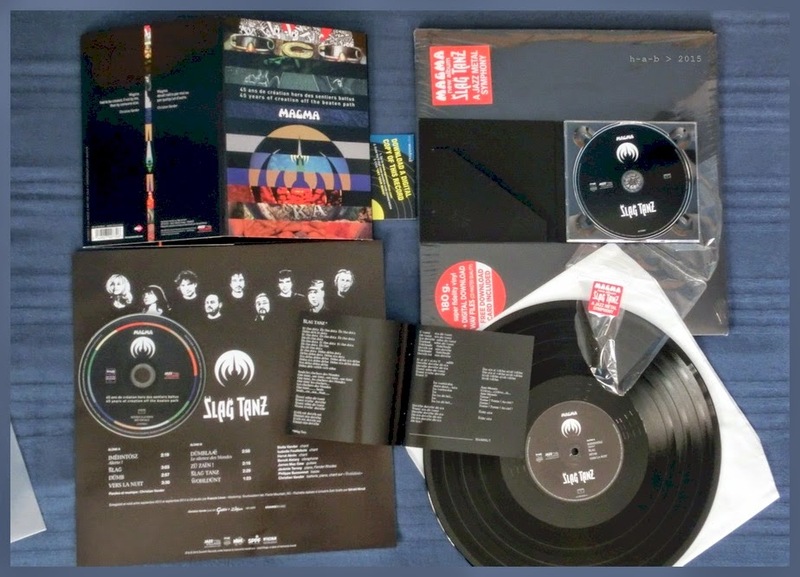 E' di questi giorni l'attesa pubblicazione in cd e su vinile del nuovo lavoro Slag Tanz, consegnato infine in una versione, più volte rimaneggiata nell'arco di un anno di registrazioni, dove si stempera in senso prospettico e pluridimensionale una partitura vocale di memorabile - e quasi insostenibile - impatto diretto nei concerti dal vivo degli anni più recenti. Contemporaneamente c'è anche un cd antologico ('45 ans de création hors des sentiers battus') che fa da apripista al poderoso programma di stampe e ristampe a cadenza mensile concordato con Jazz Village. Magma is joining up with Jazz Village to celebrate its 45th anniversary with an impressive series of new and classic releases. A series of new and classic Magma titles has been scheduled for release every month from September 2014 to November 2015. A legendary French group if ever there was one, Magma has continued to influence the course of contemporary music since their debut in 1969. Combining the energy of rock and the ecstasy of jazz, as well as numerous classical influences from Béla Bartók to Carl Orff to the Viennese school, brick by brick Magma has built a unique musical monument that is destined to be a worldwide beacon, as long recognized by their large and devoted following. During this series of releases, lasting over a year, Magma will also be on the road, performing numerous concerts in France as well as other countries where they have a strong fan base: South America, U.K, Germany, Scandinavia, Japan and the United States. Festivities kicked off in France with 3 weeks of concerts at the Triton, just outside Paris, in November 2014 and will be brought to a close in one of the capital’s largest venues in the run-up to Christmas 2015, to coincide with the release of the live box set Konzert Zünd.